Dave Handl Fly Fishing Outfitter will design an itinerary around your vacation and experience level. We provide guided river float trips on the major rivers in the area; the Yellowstone, Bighorn and Madison rivers; overnight fishing trips into mountain lakes and streams accessible by horseback, as well as guided walk and wade trips on the famous spring creeks located in Paradise Valley. Directions: Dave Handl Fly Fishing Outfitter is located south of Livingston in Paradise Valley. Follow Highway 89 south 4 miles out of Livingston toward Gardiner. Turn at Carters Bridge on Highway 540. Follow Highway 540 for approximately 13 miles until you come to Loch Leven Fishing Access. 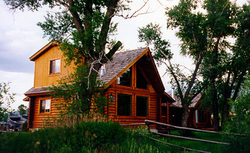 Turn right and follow the road until you come to 83; two log cabins by the Yellowstone River.